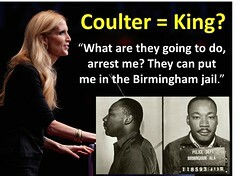 See “Ann Coulter’s Jewish Roots” at http://wp.me/p4jHFp-a1. See “Effing Jews and Ann Coulter’s Waterloo (or Damascus Road? )” at http://wp.me/p4jHFp-a9. See “First, Jews; Now, Catholics?” at http://wp.me/p4jHFp-ah. See “Jews: Quality, not Quantity” at http://wp.me/p4jHFp-al. See “When Will Conservatives Reject Coulter’s Anti-Semitism?” at http://wp.me/p4jHFp-eY. 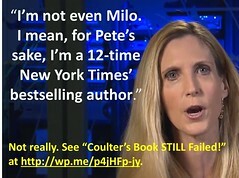 See “Is Ann Coulter Anti-Semitic?” at http://wp.me/p4jHFp-f4.